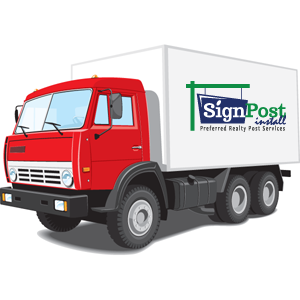 Pick Up / Drop Off Agent Equipment | SignPost Install Inc.
We are happy to pickup your equipment at no charge to you. In order to do this please stick to the following guidelines. FREE pickups cannot be time sensitive. We always attempt pickups as quickly as we can but when it is busy, they are the last stops scheduled in favor of Installs, Removals and Servicing existing installs. If the pickup is for a pending installation you should either arrange to drop off your equipment at our Manassas location or leave it on site for the installation. All equipment must be ready and available the day you request the pickup from our website. Add notes in the ORDER NOTES section if needed when checking out. If residential please make certain to have all items outside. If an office pickup please take items to front desk. Please do not leave in a locked office that is inaccessible when you are off site. Of course we aren’t going to make you ship this stuff to us. Order your pick up and we’ll be there soon to get your materials. All items are tagged with your name and separated from other agent items. We make all attempts to increase the life span of your inventory by keeping them clean and within an environment that reduces contact with items that may scratch or damage them. We will notify you immediately if we feel the quality of any item supplied has degraded over time, due to weather or unknown circumstances. We know you want your panels and installs to be perfect. We will make certain to keep you updated on the condition of your items so you can replace them as needed.